I am interested in what medium you are using is this full digital? or are you going with pen and ink on paper and scanning in and photo-shopping to clean up? I only ask cause I have a comic Id like to do but not sure how to get started on it. In the case of the Hunter comic, I start with very rough sketches on paper, but as soon as I’ve figured out how I want to lay out the main shapes in the panels I switch to digital. So the actual drawings are done almost exclusively digital, using a graphic tablet. It depends a lot on how comfortable you are drawing on your graphic tablet. I think for a lot of people, myself included, it is easier to draw on paper and then use the tablet at the end. That probably takes a bit more time though and requires a large scanner to transfer your drawings onto your computer (I don’t have one). On the other hand, you have the actual original drawings at the end too, which I think is a huge downside when drawing it all digitally. Is your comic SC related? I’d love to see it! I haven’t really figured out the universe as of yet. Just the main character which is still kind of up in the air. I don’t have a graphic tablet or a scanner for that matter (I do have access to one at work though) I am still kinda new to the whole thing but I can show some examples of my art for now on my facebook (facebook email is infinitedemon86@gmail.com). Once I have something tangible in terms of my own comic ill be sure to start posting it. 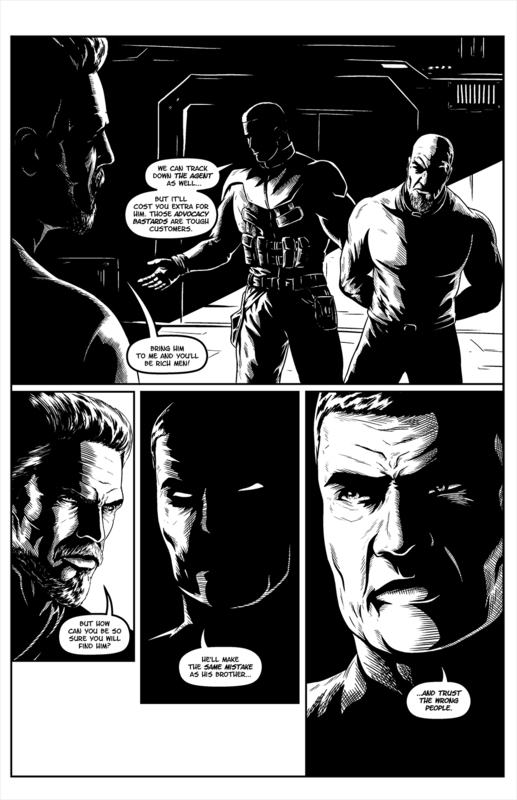 Inking noir comics is much easier digitally, as you can imagine. The paint fill is a godsend for those huge black areas. I would say it is actually the style of drawing that probably has the most benefits when switching to digital and suffers the least drawbacks, since it is not based on very fine line weight variations. While tablets these days have thousands of pen pressure levels, they still don’t compare to laying down ink on paper traditionally IMO. The good tablets are very expensive though, and the ones that aren’t expensive aren’t great So, in that regard, drawing them on paper, then scanning them at work and doing only touch up work and adding speech balloons digitally (which doesn’t need a graphic tablet) is probably the best route. Lots of people find it very hard to switch to graphic tablets after drawing a lot on paper, so that’s an expensive risk to consider. Also, as I’ve said before, drawing them on paper means you have an original at the end. It doesn’t sound like a big deal, but it’s something I really miss with the Hunter comics. Another downside is staring into a computer screen for hours is a bit more tiring than staring at a piece of paper, at least for me. Thanks. I do more then noir. if you looked under one of the drawing posts (not of girls) youll see some other works of mine. I like drawing people a lot. someone suggested I do a comic as my work could do well in one but I have never done a comic before so.. Yay! For branching out.